We know what a wedding means to you and your family. It is also a great day to share your special day with friends and relatives. The wedding service is over and you want to have fun. Do you wanna dance? Do you want your friends and family to dance? We’ve been having fun for many years. We work with you to provide the best music you can have from a live band… and that’s what you get, a live band. Whether we are in our tuxedos or our colorful suits, you get the excitement of Chicken on the Bone. After all is said, your guests will remember the entertainment and what fun they had at your wedding reception. Your guests will remember you had Chicken on the Bone at your wedding reception and they will remember your day and the fun they had celebrating with you on your special day! I finally found someone who sings JANIS JOPLIN like JANIS JOPLIN! My friends thought it was a recording of Janis until they saw her walking with the microphone in the crowd in the bar! Y’all were amazing!!!! We had so much fun!!!!!!! I’ve never been to a wedding where everyone danced!!!! Y’all are great!!! 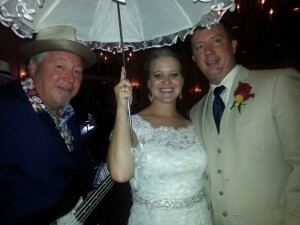 great wedding, great friends, great band! I wanted to let you know how much we enjoyed the music that Chicken on the Bone provided for Textron’s 2013 Family Day. It was a wonderful day and having your talented group entertain us Everything was wonderful. You even got high Kudos from my husband – and he is very hard to please. Great, terrific, fun, friendly, lively, funky, crazy, heartfelt, crowd-pleasing, energetic, dancing, crazy! 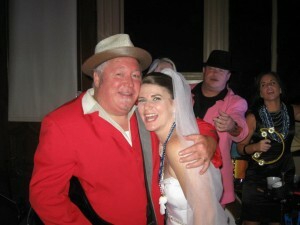 There must be more adjectives and superlatives to describe Chicken on the Bone and their wedding show this weekend. What a fantastic way to usher in a new couple to the bliss of holy matrimony. You guys are all terrific! These people are my band! COTB I caught your show this week in New Orleans!! It’s not New Orleans without Southern Fried Chicken! and it’s not Bourbon Street without “Chicken on the Bone”. You guys ROCKED the place. Gene U. THIS BAND IS highly recommended! I hired Chicken on the Bone for my husbands’s 29th birthday party and they exceeded our expectations. 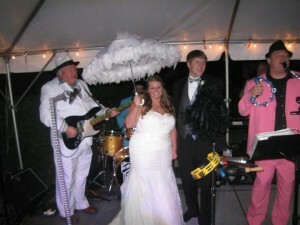 Our guests, my husband, and I had an awesome time because of Chicken on the Bone band! This band is more than accommodating with incredible talent. 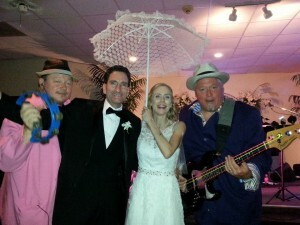 We had such a great time – my husband said “this is the best party ever!” We will 100% hire Chicken on the Bone party band again! Thanks guys!!!! MUCH APPRECIATION. Chicken on the Bone put the icing on the cake for our reunion. Our friends couldn’t stop talking for the next two days about THE BAND…not just great musicians, but great entertainers. They know how to keep everybody dancing. Our friends all wanted to know how I found you, and I told them it was love at first listen…I would not hesitate to recommend Chicken on the Bone to anyone who wants a great, high-energy band to make their event a roaring success.